Triangle weaving is fun! Period. It offers such variety that can’t be done on a harness loom. With my love of texture, I migrated to this when I first learned and have never stopped. It started with the state Tropical Weavers convention years ago, where a class of weavers put together their frames, weaved for 2 days, then wondered how we were going to get these large frames home. I remember passing cars on I-10 with frames strapped to the roofs and knew they were fellow weavers on their way back. Over the past 20 years I’ve traveled with this workshop throughout Florida plus a few other places North and had some fantastic groups. Back in those days we made our own frames and weaved full-sized shawls on 7 ft. frames. Over the years, I’ve whittled down the time for creating frames, because after all, weavers were impatient to get to the weaving. 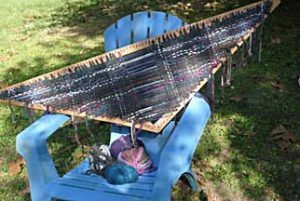 The workshops started offering two sizes: large shawls and smaller scarves, and later I offered to pre-build them. But I miss those days when we’d haul out the power tools, prop long 1×2’s across chairs, steps, or tables, and spent some time drilling, hammering, planning, and yaking about our planning. Some of the more interesting settings or helpers (you know who you are 🙂 )included a historical courtyard in St. Augustine, a wide front porch in a Victorian era house fronting the bay in Pensacola, a cabin above Atlanta on a woodsy mountain, the state park at White Springs Folk Arts Center, the gallery in Milton where we set up “shop” out of the back of a van, and various yarn shops, galleries or art centers in Destin, Charleston, Baltimore, New Smyrna Beach, and Tallahassee. The currently scheduled one for February 23-24th is at Millstone Plantation, another historical landmark sitting above Lake McBride. Millstone still raises sheep and llamas and is restoring the house and weaving studio. Ask me any questions, but for registration, contact: millstoneplantationtallahassee@gmail.com, or (850) 294-3918. See more photos from the workshops on my class pages.